For a long time, the vast majority of people just used the browser that came with their Windows computer, Internet Explorer. Over the years though, alternative browsers have been released, giving people more options when browsing the internet. Many people have made the switch to other browsers such as Google Chrome, Firefox, or Safari over Internet Explorer. Here are some recent browser usage statistics. 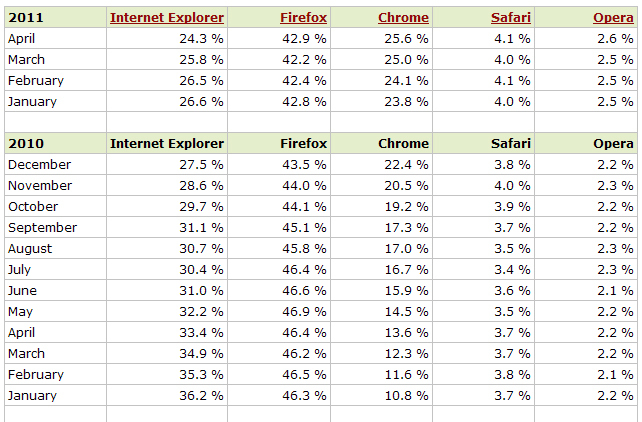 As you can see, Firefox has taken the lead as the most used browser, followed by Chrome and then Internet Explorer. For the most part, every browser achieves the same results. However, there are several differences/features between browsers that are attractive to many users which have caused them to make the switch. Below goes through some of the reasons why people may use browsers other than Internet Explorer. Firefox and Chrome have lots of cool plugins and add on’s that can make your browser more “personalized”. Some of these are purely cosmetic features, such as changing the colors, while others are great tools for web developers, bookmarking, etc. Even though most people now have high speed internet, it’s still important to load pages as fast as possible. Firefox and Chrome and known for their speed, which is highly appealing in a world where everything happens so quickly. Newer technologies for web development such as HTML5 and CSS3 are simply not compatible with Internet Explorer, making the web a less fun and interactive place. Microsoft’s newest release of Internet Explorer, IE9, allows for some of these technologies, but unfortunately the many people still running Windows XP will not be able to download it since it’s only compatible with Vista and Windows 7. Many web developers are discouraged with Internet Explorers lack of support for these new standards and have been designing for newer browsers, leaving Internet Explorer users to see boring versions of their beautiful websites. People that use standard compliant browsers can see a sleeker version of their favorite websites. The browser you choose to use has a lot to do with personal preference and we’re not here to tell you which one is the best. The choice is up to you! Do you prefer one internet browser over another? Which do you use? These numbers are horribly inaccurate. According to all legitimate numbers, there are more users on IE8 than all FireFox versions together. It is disappointing to see that w3schools has published false data, but even more disappointing that the author of this article bought into the nonsense. Scott-Thank you for providing links to different statistics. It's hard to determine which site is more accurate. The point of this article was not to show statistics as much as it was to give some reasons for why many people are switching to different browsers. A big part of our company is web design, so it's important for us to take these different browsers into consideration. There's no doubt that with the release of new browsers, many people will be using ones other than IE. We'll have to acommodate for them. The statistics from w3schools make sense only when you realize that those numbers come from analysis of the w3schools web logs. In other words, techno-geeks who visit w3schools are moving more quickly from IE to other browsers. You cannot use this information to draw any conclusions about browser usage in the general population, other than perhaps a general trend away from IE. Thanks, Scott, for the links to more useful information.